If you are jobless or thinking of quitting your job and starting a new business. Start a dropshipping business and watch the money rolls in. Dropshipping is a popular e-commerce business model of selling products online without buying them first. No doubt this is the best way to sell products online. Yes, you can too start dropshipping by selling products online without having to pay for any inventory upfront. You can be the owner of your business which was still a dream for you. This method is retailing of products through online stores. So, it eliminates the need for holding and managing the stock, allowing you focusing on improving sales and marketing skills. It is no big deal. It just takes few minutes to set up a fully functional e-commerce site and you are ready to start. Before stepping into the e-commerce world, let’s gather up some knowledge about dropshipping. Dropship entails setting up an online store, finding out the suppliers who will accept your orders and ship the products to the customers. You can notice here that you can run this business without housing stock or worry about shipping and logistics. Dropshipping is fulfilling customers order directly from the manufacturer or wholesaler. This goes like a customer visits your website, places an order and pays you the price you mentioned there. Only after you get the payment, you proceed the order to your supplier to fulfill it. Then the supplier ships the product to the customer. The (profit) margin between the rates you charged from your customer to the rates you paid to the supplier is your earning. This is how you are at no-loss business where you only pay for the product when a customer has already given you the money. There is no investment needed in dropshipping and it is the best way to sell products online. Dropship business model is the best way to sell products online and a great start-up option. It has a number of advantages and it’s hard to narrow them down. We have listed them for you to make you get a much deeper idea about them. Low overhead cost: Because you don’t have to buy the inventory, manage the stock level or maintain the warehouse your overhead expenses are low. Moreover, you also don’t need to hire more staff and track the products. Even when you add more products and grow your business later, your expenses will be relatively low compared to other kinds of businesses. Save time: As everything is done online you won’t have to keep running in search of suppliers, wasting your time. Along with this, you don’t have to deal with the procedures of packing and shipping the products too. It takes a few minutes to confirm the order and pass it on to your supplier. Selling a product online and fulfilling the customer’s demands is just a matter of minutes. Highly scalable: As you don’t have to fulfill each and every order yourself, you have plenty of time to scale up your business. You can expand and add more products from different suppliers to grow your business as it takes no time to attain a customer’s order. The work is all same whether you sell 10 products or 50. Validate new products: With this business model, you can easily expand the product offerings. You can validate new products according to the weather or trend. You won’t have to run to different suppliers for purchasing physical stock. Adding more products to your business is just some clicks away. Freedom of location: You won’t have to search for a place or warehouses to keep your stock for starting a business. Whether you are in a kitchen or on a beach, you can operate your business right from the location you want. You don’t have to be at particular place bounded for hours. You can perform your other activities and handle other important works too. Reduce risk: Since you don’t have to buy the stock or look for a warehouse to place the inventory, you won’t have to invest much. The products you sell are directly shipped from the suppliers to the customers. You only have to purchase a product when you have got an order and when a customer has already paid for the product. Thus, you are at no risk of facing a loss. More to this, if you are unsatisfied with a product or face any difficulty in selling it you may easily switch to other suppliers. Easy to get started: There are advantages of less investment, plus no headache of stock-keeping, location, packaging, or shipping. Still you own the products, earn and can become the owner of a business. Isn’t it easy? Starting your own business only needs finding out a reliable supplier, and setting up a website right through your home. 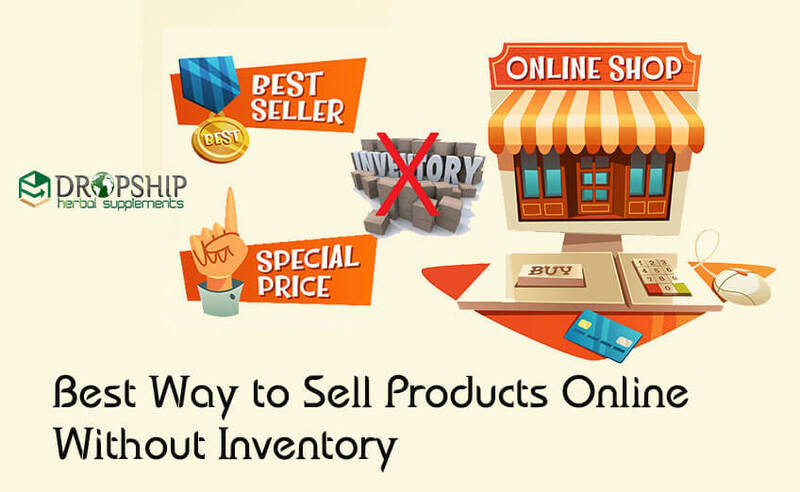 You can easily get started to sell your products online without inventory. Less capital needed: There is no capital needed in building up a dropship business. As you don’t have to buy any stock or inventory upfront, you won’t have to pay or invest in anything. And since you don’t have to rent a place for warehouse, you won’t need any money. Moreover, you won’t have to worry about the expense of maintenance of the stock. Even when you start running a business you won’t need any money to keep it running. What you will get is only your earnings. Hence, to sell the products online using dropshipping is a profitable idea. Maintains brand integrity: The suppliers who ship the products for you will do the packing and boxing with your brandings. So, the order will look like it is shipped by you. Hence, having no need of shipping the products, you will get the recognition and will still have the stock or inventory in warehouses of the world. You can freely sell products online without inventory. Isn’t that great? Large online marketplace: As you step into the world of dropshipping to the time you have scaled the business, you will come across many distinct suppliers and manufacturers. Now it’s up to you how you want to expand your business. Either you can remain stick to a particular niche or you can opt for different niches. You have been built your own mini marketplace by then to experiment more. How to sell products online using dropshipping? Dropship is the best option when you are thinking to start your first business. Get started and sell products online without inventory. Here is a step by step guide on how to sell products online using dropshipping. The very first step is to find an online dropship program or you can say the suppliers who will let you sell their products online. You can choose from the hundreds of the items they offer you. Find an efficient dropshipping website, sign-up for the dropship program, and avail the benefits to sell products online without inventory. Select the best selling products or the products of your choice that you want to sell. The next step is to choose the platform. Either you can create your own e-commerce website or you can list your products on marketplaces like Amazon and eBay. If you are unaware of designing a website and don’t want to pay for creating your own e-commerce website, then use Amazon and eBay as your platform as they are the best ways to sell your products online. Proceeding to the next step, after you have listed your products on the website, you can start to sell products online without inventory. In addition to this, you can also do the marketing for your products by writing blogs and promoting the products you are selling. The next phase comes when you start getting the orders. When you get an order from your customers, confirm the order and collect the money from them. Then open your dropshipping account you have signed up earlier and order the same product. Pay the discount rates to your supplier keeping the profit amount with you. Now the supplier will soon ship the product you ordered to your customer. This is how you will sell the products online without inventory. Gradually, you will learn more tactics and get to know how it works. You will get familiar with the online market and demands of the customers. Then you can think further about expanding your business to sell products online using dropshipping. If you have made up your mind to launch your new business and are in search of the suppliers, give us a chance. DropshipHerbalSupplements.com is the best dropshipping company of herbal supplements and natural health products. We offer you a wide array of quality products that are popular all over the world. As our products are natural and have no side effects, people prefer to buy our products. As dropshipping is the best way to sell products online, our products are the best to acquire one’s attention. We believe in keeping constant communication with our dropship partners. They, hence, won’t feel any inconvenience in maintaining the happy customers on their websites. Our fast shipping services will make it easier for you to sell products online using dropshipping. You won’t have to worry any longer about your customer’s satisfaction as it is our responsibility to fulfill their expectations. Sign up with our dropship program and undoubtedly you will be at safer hands, choosing the best way to sell products online. DropshipHerbalSupplements.com will enable your dream of being the best dropshipper to come true. In today’s era where people are very much health conscious, you will never go wrong selecting our natural health products for your dropship business. Be the owner of your business and get started now.